North Korea has made significant progress with its missile technology and nuclear weapons development. In response, the UN has imposed strict sanctions on Pyongyang to curb the regime’s access to key resources. Illicit trade networks, however, undermine these measures, allowing North Korea to effectively skirt sanctions. The media is swamped with coverage of North Korea’s latest advancements in its weapons of mass destruction (WMD) program. 2017 has been a tumultuous year with the first successful test of an ICBM and, reportedly, a hydrogen bomb. Added to this is the launch of more than a dozen missiles, two most recent ones flying over Japan prompting emergency procedures and widespread fear in the northern regions. Surely, it has been North Korea’s most active year in terms of its WMD development. Nuclear weapons development and missile testing is a gargantuan undertaking requiring a constellation of rare materials, equipment and the highest levels of talent. Just the equipment and materials alone going into a single missile test launch cost a small fortune. So how can they afford all this? Given the country’s lack of basic supplies, widespread famine and international efforts to curb its access to resources (financial or otherwise), these expensive endeavors are indeed baffling. The answer lies with North Korea’s illicit trading activities. North Korea’s multiple sources of funding – both legitimate and illegitimate – significantly undermine UN sanctions’ efforts to prevent North Korea from obtaining resources to further develop its WMD program. North Korea’s export revenue amounted to $2.83 billion in 2015. Minerals (coal, iron ore) and textiles, taken together, constituted 73 percent of this figure. Interestingly, coal exports alone brought in almost a billion dollars, representing around 34 percent of the country’s entire trade revenue for the year. 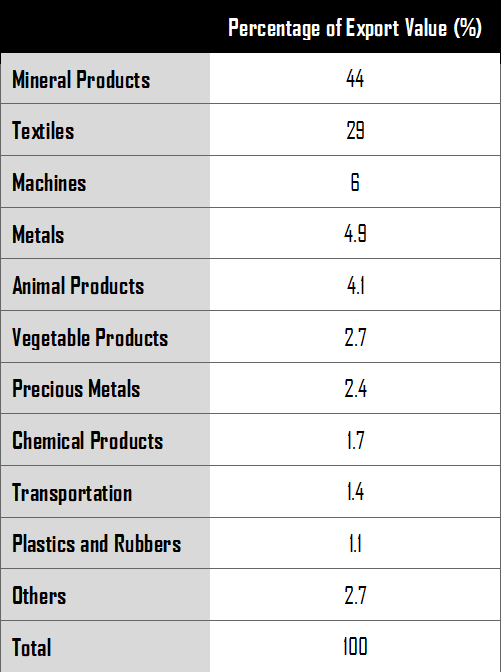 Other significant trade revenue came from machines, metals and animal products, which brought in more than $420 million. Additionally, export labor, where North Korean workers are sent abroad, brings in hundreds of millions of dollars in annual revenue. It is estimated that North Korean authorities earned more than $120 million a year from laborers sent to Russia alone. Trade revenue not only gives Pyongyang access to funding but is also a major source of foreign currency used to import materials and equipment for its WMD program. UN sanctions, especially those voted on this year, target North Korea’s export revenues precisely for this reason. The resolutions set a complete trade embargo on coal, mineral, seafood, textiles and workers. Taken together, the sanctions will ban well above 76% of North Korea’s annual export revenue. The measures will also reduce, by 30 percent, oil imports by North Korea in addition to completely banning natural gas products going into the country. North Korea currently imports 8.5 million barrels of oil a year mostly from China. By limiting this intake to 2 million barrels a year, the sanctions reduce annual oil intake to less than a quarter. Since North Korea mainly relies on imports for oil, there is little doubt this would significantly reduce the country’s energy supply. These sanctions hope to achieve two things. First, they formally commit UN member states (henceforth “member states”) to comply with applying economic pressure on Pyongyang. Second, the resolutions aim to directly diminish Pyongyang’s ability to procure equipment and materials for weapons development by disrupting their sources of funding and cutting off supply routes. Sanctions experts and diplomats have long established that much of the export revenues, including remittances from foreign North Korean laborers, are funneled into North Korea’s military and nuclear weapons programs. The sanctions succeed in committing key member states to tighten their grips on Pyongyang. A case in point is China’s recent decision to enforce stricter economic sanctions. Ever since the first UN sanctions (going back to 2006) on North Korea for its nuclear weapons program, China and Russia have been staunchly against imposing tough sanctions on the regime. They have shown repeated reluctance which carried significant weight as veto holders of the Security Council. Once the sanctions have been agreed to, however, diplomatically visible nations such as China and Russia have little choice but to conform to the sanctions lest they damage their reputation and undercut years of effort to become rule setters rather than takers in the international system. Indeed, after the recent resolutions have been passed, China has stepped up its efforts to more effectively stem prohibited financial and trade activities with North Korea. Since China’s influence now reaches many of the non-conforming members states clustered in Africa, more ambitious embargo efforts by China can potentially influence those countries that have yet to fully enforce existing UN sanctions. Many of these nonconforming nations are tethered to China through developmental and economic assistance. Angola, Mozambique, Democratic Republic of Congo (DRC), and Namibia, just to name a few, all have significant financial backing and developmental dependence on China. If Beijing really wants to stifle Pyongyang’s nuclear ambitions, it could theoretically plug many loopholes acting as backup sources of funding by pressuring these nonconforming states to sever economic ties. Simple math would prove that the cost benefit analysis significantly favors a deal with China. However, as a preventative measure, the sanctions alone (i.e., without voluntary expanded efforts by influential members such as China, as discussed above) fall far short of disabling North Korea’s ability to procure resources for its WMD program. It is true that since North Korea’s international trade heavily relies on China, an expanded embargo that includes Beijing does indeed pose a serious threat to North Korea’s economic sustainability. Yet, a complex network of illicit trading routes that North Korea has established over decades mean that an embargo would not be enough to prevent Pyongyang from pushing forward with their nuclear weapons development. Some of these illicit networks exist because certain member states do not comply with the resolutions, enabling North Korea to earn revenue by providing military equipment and services. The presidential guards of Angola and the DRC, for instance, receive military training by North Korean personnel. North Korea also sells conventional weapons to certain member states. In the DRC, for example, North Korea sold 9-mm firearms to the country’s police force and the same presidential guards it trained. The irony here is that these firearms, through the deployment of the DRC’s police force, also made their way into the UN Multidimensional Stabilization Mission in the Central African Republic. Eritrea is also under scrutiny for illegal arms dealing with North Korea. The UN Panel of Experts on the issue is under investigation into the interception of a shipment of arms that was on its way into the country. The violations go beyond military training and small arms provisions. Mozambique, Syria and Tanzania have all either received surface-to-air missile systems or hired North Korean personnel to maintain and repair them. In the case of Tanzania, the total value of military-related contracts with North Korea is reported as over 10 million euros. Evidence shows that North Korea may also be converting civilian items of trade into vehicles of war. Photographs of military trucks from the military parade held in April show that the trucks carried a “Sinotruk” logo, displaying identical features with the Sinotruk Howo 6×6 series. In response, China noted that the sales contract explicitly requested that the buyer ensures civilian use of the trucks. This indicates the conversion occurred under the radar and in violation of the original contracts. Whether China is knowingly or unknowingly supplying the trucks is also anybody’s guess. Another example of such dual-use items switching hands from Chinese companies to Pyongyang is the shipment, in June, 2016, of $800,000 worth of radio navigational equipment that could potentially be used in North Korea’s banned ballistic missile program. These illicit activities beg the question of how North Korea actually transports these prohibited items given strict maritime trade regulations. North Korea trades through a complex web of illicit maritime shipping networks. It manages fleets of ships owned by shell companies and operating under foreign flags to skirt sanctions. In violation of resolution 2321 (2016), 13 of North Korea’s vessels have been registered as foreign owned or operated. At least ten vessels reported the Fijian flag using falsified documents issued by the regime. North Korea’s Maritime Administration is one of the key institutions conducting the country’s overall illegal shipping operations. Its strategies include the renaming and re-registration of its vessels, providing certification for crew and vessels flagged by UN resolutions, and falsifying documentation and vessel identities. The seizure of the ship Jie Shun offers a prime example, the report goes on to explain. Jie Shun left the North Korean port of Nanpo in June 2016. It made no port calls until being intercepted by the Egyptian authorities in August 2016 before reaching the Suez Canal. The cargo on board the vessel included 30,000 rocket propelled grenades and subcomponents. In total, the cargo included 132 tons of weapons hidden under 2,300 tons of iron ore. The weapons were entirely manufactured in North Korea. Given the fact that North Korean rocket propelled grenades have been identified in Syria and Lebanon, one can take an educated guess on where these weapons were headed. Going back to the evasion tactics discussed above, in the case of Jie Shun, the vessel sailed under the Cambodian flag and all 22 of its crew including its North Korean captain were certified by the Maritime Administration. The maintenance and establishment of far-reaching illicit operations is made possible by overseas sanctuary ports. The Hong Kong port is a major hub that North Korean front companies can use as an operational base. This is possible because it is not illegal to do business with North Korea in Hong Kong. According to C4ADS, company records show that although some are registered as being operated by North Koreans, the majority, in fact, employ Chinese nationals to obscure and mask North Korean ownership. Jie Shun, like many others, was also owned by a Hong Kong-based company called Vast Win Trading limited, which, in turn, is owned by a Chinese national. In short, these front companies have complex ownership structures involving shell companies that are in turn owned by other shell companies. The individuals who own and operate these entities are also foreign nationals who cooperate with North Korea. The ships that they own sail under various flags and frequently change names and identification through falsified documents from a government institution. This complicated matrix makes it incredibly difficult for member states and their agencies to enforce sanctions properly and effectively. Indeed, between October 2016 and May 2017, the UN Panel of Experts reported that North Korea had made at least $270 million by continuing to export prohibited commodity items. Another source of illicit revenues comes from cybercrime. Hacking computers worldwide and planting malware that freezes files until users agree to send money is a form of cyber-ransoming hackers linked to North Korea recently conducted. The latest and most widely known case was the spread of the malware WannaCry. The ransomware froze access to files of computers infected with it, demanding the payment of $300 to the users for the encryption to be lifted. It only took the first several days for it to yield around $50,000. Fireeye, a cybersecurity company, has recently reported on North Korea’s hacking activities focusing on stealing cryptocurrencies such as bitcoin in order to convert them to hard cash and fill state coffers. The prime targets have been South Korean cryptocurrency exchanges. In the first half of this year alone, Fireeye finds that North Korea has conducted five cyberattacks on South Korean cryptocurrency targets. Another strategy North Korea is known to employ is hacking ATM machines. Hackers would plant malware in South Korean ATM machines in order to steal bank-card information. Subsequently, they would get people in other countries such as Taiwan and China to withdraw money from the ATM machines in those countries. Although this method only yielded several thousand dollars, it sheds light on how various these cyberattacks can be. Larger scale attacks include the hacking of large financial institutions. Bangladesh’s Central Bank presents a case in point. The hackers stole and used the Swift credentials of the bank in order to siphon money from its foreign reserve accounts at the New York Fed into fraudulent bank accounts set up in the Philippines. The heist yielded US$81 million. Another example is the hacking of the Taiwanese Far Eastern International Bank. The same hacking group allegedly stole $60 million from the Taiwanese bank. North Korea’s illicit activities would not amount to much without its access to the global banking system enabling it to send and receive money. Similar to the network of front companies keeping its international maritime trade operations afloat, North Korea also relies on front companies in China to evade sanctions and conduct banking activities. Knowingly and unknowingly, major financial institutions end up providing banking services to these front companies and individuals engaged in prohibited activities. Foreign companies with links to North Korean financial institutions either through joint venture (JV) structures or foreign investment also act as loopholes that North Korea can exploit to gain access to global financial markets. Both the JV and foreign investment link to a foreign company provides North Korean banks access to the international financial system and, by extension, international funding. The layering and commingling of funds helps disguise the ownership, origin and control of funds associated with prohibited activities. This helps North Korea circumvent UN financial sanctions. With continued successful nuclear and missile tests peppered throughout the year, it is clear that despite UN sanctions, North Korea is continuing to obtain what it needs to make significant progress in its WMD program. The sanctions can indeed reduce revenue earned through legitimate means. However, they will fall far short of an effective embargo. Through its underground network of front companies and international sanctuaries, they will continue to export and import prohibited items and conduct financial transactions associated with them. Unless the sanctions begin targeting North Korea’s ways of circumventing them, they will fail to halt Pyongyang’s efforts to continue developing nuclear weapons.